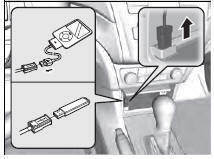 • Do not leave the iPod® or USB flash drive in the vehicle. Direct sunlight and high temperatures may damage it. • Do not use an extension cable with the USB adapter cable. • Do not connect the iPod® or USB flash drive using a hub. • Do not use a device such as a card reader or hard disk drive, as the device or your files may be damaged. • We recommend backing up your data before using the device in your vehicle. • Displayed messages may vary depending on the device model and software version. If the audio system does not recognize the iPod®, try reconnecting it a few times or reboot the device. To reboot, follow the manufacturer's instructions provided with the iPod® or visit www.apple.com/ ipod.